Treat your special ones by ordering online this Fancy Spider Man Designed Stationery Set for Lovely Kids for them and show how special a place they hold in your heart. Let your Little Prince carry his favorite character to school with this Essential Stationery Set in Spider Man Design, along with Color Pen Set of 12 and Coin Bank. 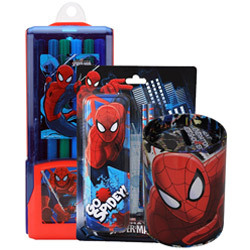 This Stationery Set has unique features of Spider Man Print in bright Refreshing Colors, made of Fiber Plastic Material for Long Lasting Use, Easy to Maintain, Easy N Smoother to Use, Durable with No Toxic Effect, comes in Stylish Plastic Case and Easy to Carry while Traveling.